I have 18 years of experience as a gunsmith and custom gun maker. 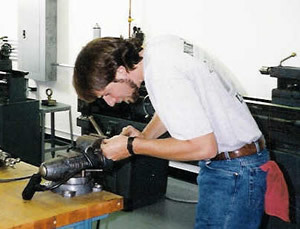 I trained first as a machinist then my interest in guns and mechanical things brought me to be accepted into the Gunsmithing Program at Trinidad State Junior College in Trinidad, Colorado. After graduating from TSJC, I was fortunate enough to work with barrel maker Mark Chanylnn of Rocky Mountain Rifle Works, Boulder Colorado, for 8 years. We specialized in building custom target and hunting rifles, along with a wide array of handguns, AR-15's, and all things accurate. General gunsmithing and repair work were thrown in for good measure. We built 300-meter rifles for the US Shooting Team and several small bore guns for the Sportsman's Team Challenge. We saw just about every sort of firearm from full blown 1911 conversions to Remington and Winchester target rifles, to classics like Winchester high walls and Ballards. In 1997 I was asked to return to TSJC and teach gunsmithing and did so for 9 years. I taught bench metal, basic and advanced barreling, basic and advanced machine shop, blue printing, AR-15 barreling and accuracy, and bolt rifle accuracy. I also taught -- and still teach -- courses during TSJC's National Rifle Association affiliated summer program. I decided to return fulltime to my passion for building custom firearms and have since opened a business in Southern Colorado just outside of Trinidad. I have a complete machine shop that allows me to build custom guns and parts for just about any situation. I have my own testing range as well as easy access to the NRA Whittington Center, less than 30 minutes away. My other passion or some may call it an obsession is hunting. As an avid shooter, hunter, and wildcatter, I have built, shot and hunted with many types of rifles and handguns in a wide variety of standard and wildcat rounds. I learned handloading at an early age from my father -- an accomplished competitive handgun shooter and craftsman -- and learned the Devil is in the details. Accuracy is in every step of loading the ammunition: from weighing bullets and cases to checking the concentricity of loaded cartridges. I have spent hours working to find the best combinations of cartridges, powder and bullets to make the most accurate loads for different situations. 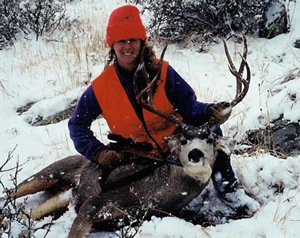 I have built several firearms for women and youth hunters and have the knowledge to help each individual determine the best firearm and caliber for their size and experience.